Your life is beautiful, even when you can’t see it. Sometimes it’s difficult to believe, sometimes life is just too hard to slow down and take the time to notice, but uncovering the beauty in your life can change everything. It’s time to look closer, to cultivate gratitude, to dust away the cobwebs and let your life shine. 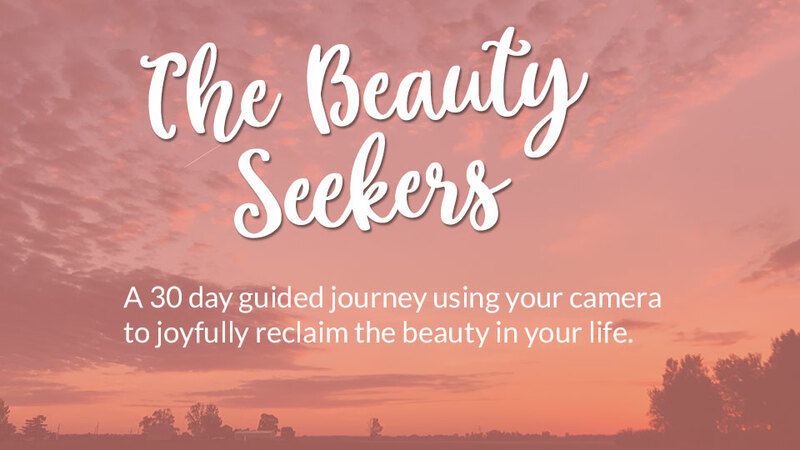 The Beauty Seekers is an e-course that uses photography to help you witness the beauty in your own life. We will journey together seeking out moments, objects and people that fill our lives with meaning while honoring the gifts we have been given. Gratitude with every photo. Loving Focus in every moment. Every day for 30 days you will visit our special course website to view the assignment for that day. Share your photos or keep them private, whatever feels best for you. At the end of 30 days you will have collected beauty you do not notice today. Through 4 weeks of intention filled attention you will form the habit of seeking beauty, you will become a beauty seeker. Receive creative inspiration designed to help you work through our current theme.